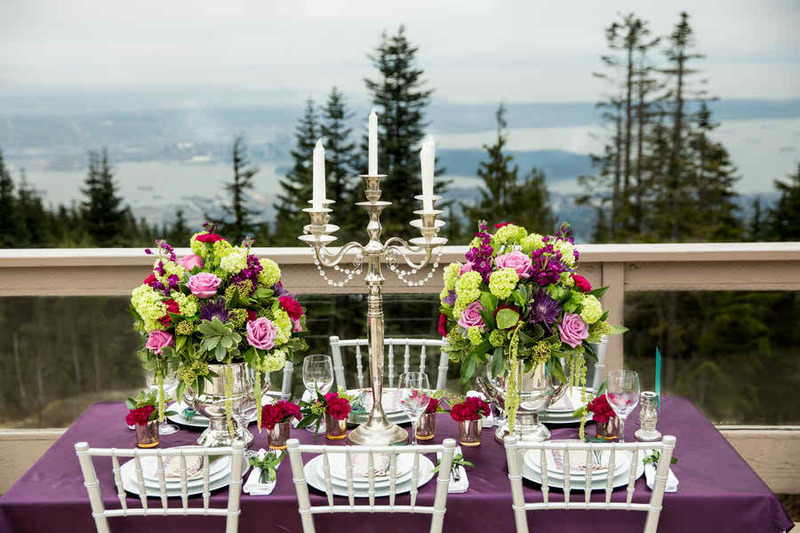 What happens when a talented team of pros in Vancouver get together to create a styled shoot? All kinds of amazing things. That's what. Capturing beautifully by Joanna Moss Photography and with event design by Umbrella Events, I have a feeling you're going to fall in love with everything about this modern, color-filled shoot. From the photographer, "This shoot was organized so that every last detail made sense with the theme. We started with the venue Grouse Mountain in Vancouver, BC. Although there was no snow on the ground this year, that didn't stop the snow from starting to fall mid-shoot making us take everything inside, very quickly I may add." This shoot is so gorgeous. And to be honest? It's the kind of shoot I wish I was there to experience. I once had a chance to visit Vancouver. And I was instantly taken by it's beauty. And this vivid, detail-filled shoot? Well, I'd be lying if I said that it was not making me wish for a return visit. Let's take a scroll, shall we? The collaboration was fantastic; decor and design was organized by Umbrella Events, Fort Langley Rentals and Joanna Moss Photography; day of design was assisted by Cake and the Giraffe. First off, can we just talk about how gorgeous this floral design is? Maple Ridge Florist did an amazing job incorporating the color palette. And whoa! I'm just loving how everything just pops against the gorgeous natural scenery. Huge hugs to everyone who came together to make this beautiful shoot come to life. There's beauty to be seen in every single detail. And your love for what you do is evident. 7 Comments " Mountaintop Peacock Palette Wedding Inspiration "
Check out www.RicketyRack.com for sparkling wedding-ready dresses! It’s certified stylish, top-rated, and universally popular! Oh that watercolour painted cake is incredible!! That cake is a masterpiece!